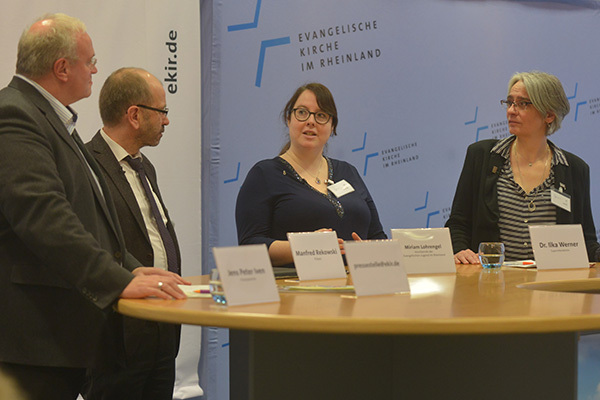 Closing press conference at the Regional Synod 2018: press officer Jens Peter Iven, predsident Manfred Rekowski, Miriam Lohrengel and Dr Ilka Werner. Speaking at the press conference, Dr Ilka Werner, Superintendent in Solingen and Chair of the Theological Committee, said that the theological position statement “On encounter with Muslims”, that had been adopted by the Synod earlier that day, formulated and brought together insights from the last 50 years of Christian-Muslim dialogue. We can engage in dialogue, as Muslims take seriously the traditions of the Bible and both religions relate to it, according to Dr Werner. It is now a matter of recognising the different interpretations and setting these in a good relationship with one another. The aims of setting out a position for Christian-Muslim dialogue was to get to know each other better, to enable joint action and to respect the traditions of each.